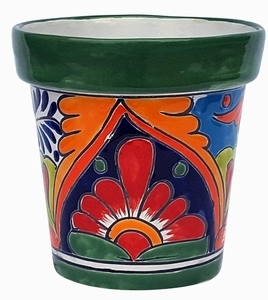 This Vaso garden planter is a standard flowerpot shape but painted with the traditional Talavera pattern and design. You will not find white and black anywhere else and our Mexican factory commissioned it just for Arizona Pottery. Available in many sizes from small tabletop pots to extra large garden planters. Group them together with different sizes to create a large beautiful landscape display. Hand-painted Talavera pottery has been well known for years in the pottery industry. Imported from Mexico where artisans create original designs and hand paint each item painstakingly. Each pottery piece will be unique and original. No two pieces will ever be identical. 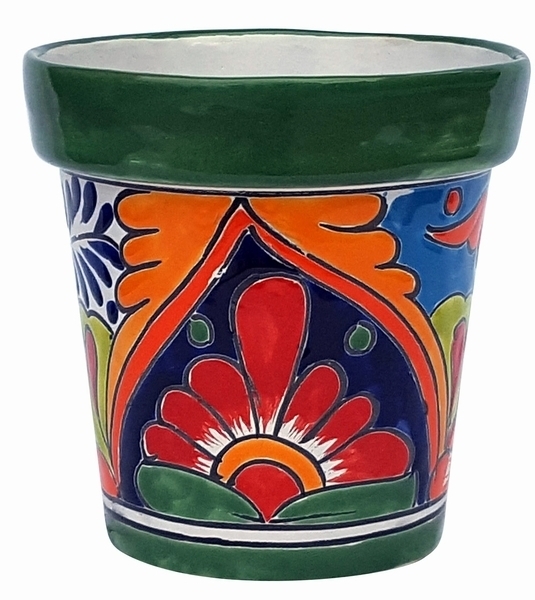 Bold bright colors, floral designs, traditional patterns as well as original designs all come together to create what we believe to be the most desired home and garden pottery we sell. Due to the nature of Talavera, colors and designs will vary. Tip: We recommend if using outdoors you cover this piece with furniture wax to help retain the color and reduce crazing.